Parking Perspectives – Pricing, Policy, Forecasting. ParkingPerspectives is a UK-based global consultancy team. We draw on latest thinking from academics and practitioners to develop and promote policies and strategies for parking for our clients. For local authorities in the public sector we specialise in parking strategies that recognise and promote the changing nature and needs of our urban centres. 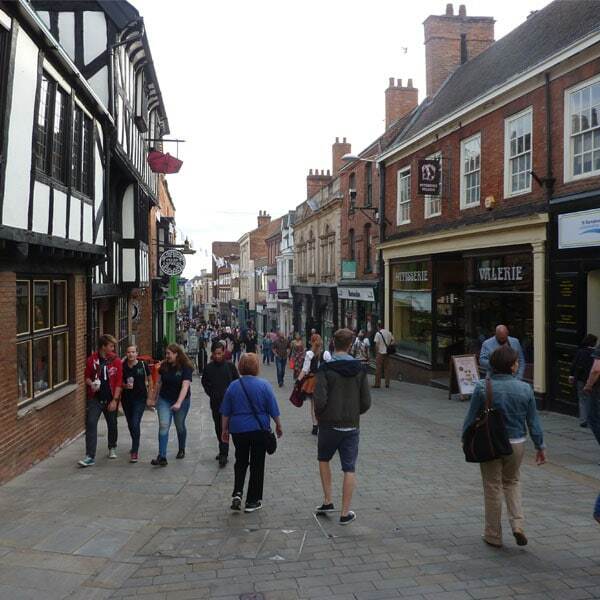 As the High Street competes with out of town retailing and the internet, it and the town centre must differentiate itself to provide less of a location for buying commodities and more of a destination that people want to spend time in. The way parking is organised, priced and managed, as well as the more fundamental need often to give up existing parking areas to allow the types of development needed by our towns, are fundamental to facilitating this change. For commercial operators we can provide quantitative support on revenue trends and utilisation forecasts. When we consider a parking strategy there are a range of options and choices that we make that influence the kind of place we create. Do we create a North American style model with each retail unit surrounded by plentiful parking or do we favour a historic pedestrian streetscene? Does car parking take precedence over the street scene and the visual beauty of the built environment? To what extent should car ownership be a function of having access to somewhere to park the car? 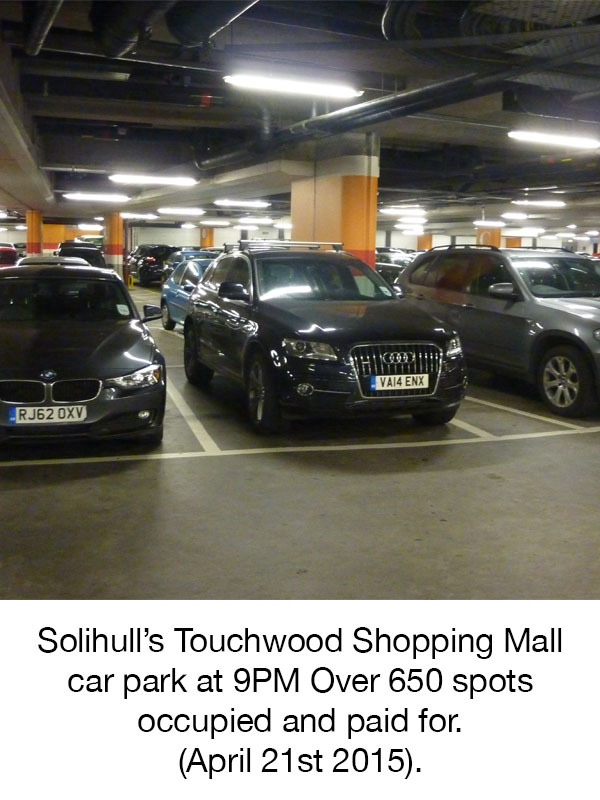 Car parking in our town centres mean that cars enter the town centres. Attracting and serving vehicles within the city creates severance, pollution, noise and personal risk to pedestrians and cyclists. Do we want to provide access in other ways? To what extent does the town need to provide parking for all occasions and what happens if it doesn’t? Do we want large parking areas or discrete locations throughout the town? How much public money should be spent to make our car parks clean, safe and easy to use? What controls are used, what level of service we want to achieve. Should we provide premium parking for those that want high service and access. Should those coming to the town to shop enjoy lower cost parking and how then is that paid for? Should we protect on-street parking for residents, for those with mobility needs? What is the right charge to apply to those using a public asset to park their car? Parking underpins economic well-being but also promotes car use and car access into parking areas. Attracting and serving vehicles within the city creates severance, pollution, noise and personal risk to pedestrians and cyclists. One of the principal roles and services we offer is to consider the purpose and intent for parking in our clients’ towns, cities, campuses, parks and service areas based on the overall benefit and contribution to the community it serves. In inner city residential streets residents, commuters and visitors may compete for the available kerbspace to park their vehicles. It is not unusual for the greatest point of conflict to be in the early evening when residents return home but city workers have not at that time departed. the zone extends into and up to streets on which there is little or no demand from the local residents for on-street parking as those properties have off street parking within their curtilage and there is no conflict. The approach adopted by authorities in many towns and cities is to extend the zones in response to actual complaints of conflict for space between residents and workers. Many authorities rely on a minimum number or quantity of residents supporting the introduction of a zone before progressing. This approach thus relies on a problem occurring before the Council reacts. This process of continuing extension can go on for many years and to the general dis-satisfaction of residents and to the reputational detriment of the Council as the issue is merely pushed a little farther out at each extension. To be effective, Residential Parking Zones do require enforcement and administration. It is for this reason that it is common for Councils to apply a charge to residents for any parking permit held. The scheme may also create complexity for those receiving visitors or workers to their home who will be obligated to show some permit or pass for the duration of their stay. 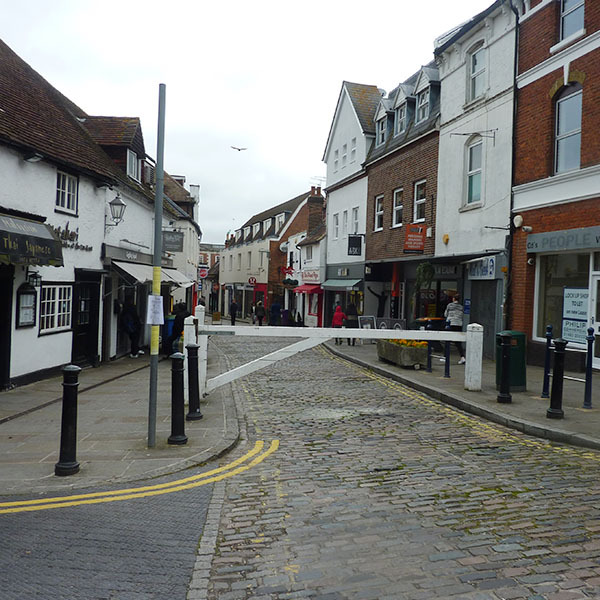 Restriction of streets for exclusive residential use can also interfere with parking used by those visiting local business and retail premises. For these reasons, residential parking zones are not necessarily universally popular amongst those for whom they are designed to benefit. 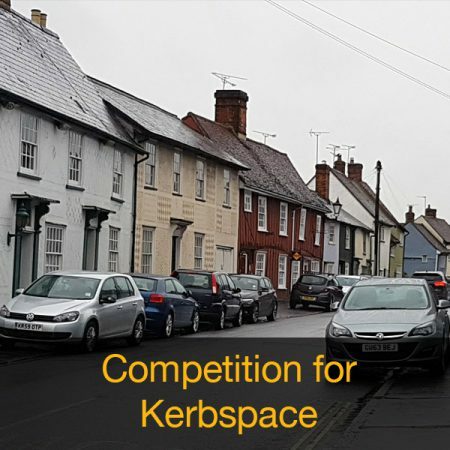 A key principle for any residential parking zone is for the number of permits issued to be controlled by the available kerbspace within the zone. Policies that permit unlimited permit purchase or link permits to properties are subject to creating a situation where the service provided by the permit degrades and creates on-going chronic difficulties for residents seeking parking near their homes. 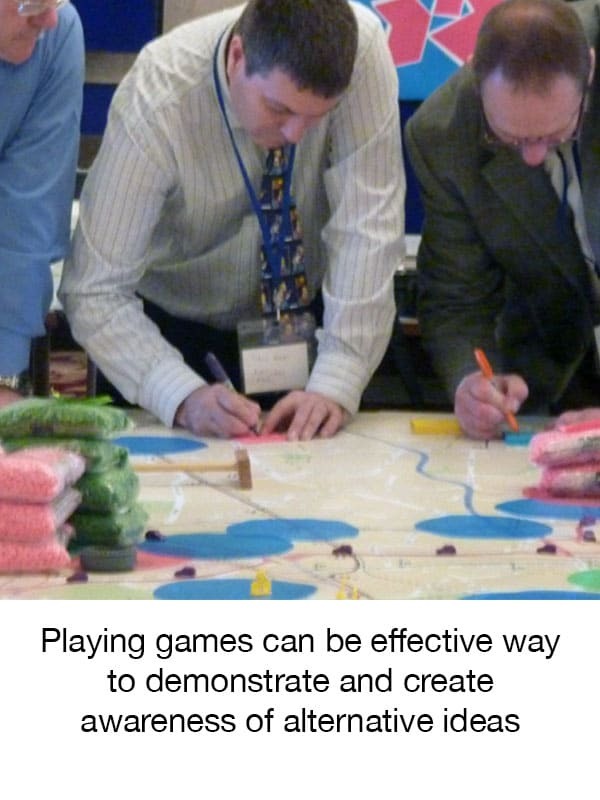 Many towns and cities have set out ambitious and exciting visions to reform the shape and appeal of their central area. These plans include redeveloping land to improve the retail offer and create new food, beverage and leisure attractions to improve the night-time economy. We have assisted a number of local authorities plan out the re-purposing of their current car parks to facilitate new developments. Part of this process may include defining what parking will be required at five yearly intervals over the next twenty years. The redevelopment itself will also will lead to greater parking demand on the town centre. New attractions and an extended offer will also change the type of parking demand required across the day. Many towns are seeing a major shift in how people spend time in town and shopping centres are turning over far more floorspace to food and beverage and facilities that provide leisure services. This will impact on dwell times, types of visitor, expectations and peak hours of usage. On this basis the type of parking and its specific location in relation to key attractors within a town or city are key aspects of a strategy as it moves through the forecast developmental timeline. Additional considerations may rely on a wider assessment of parking demand driven by office, leisure and population growth expectations, underlying car usage trends and changes to design standards. 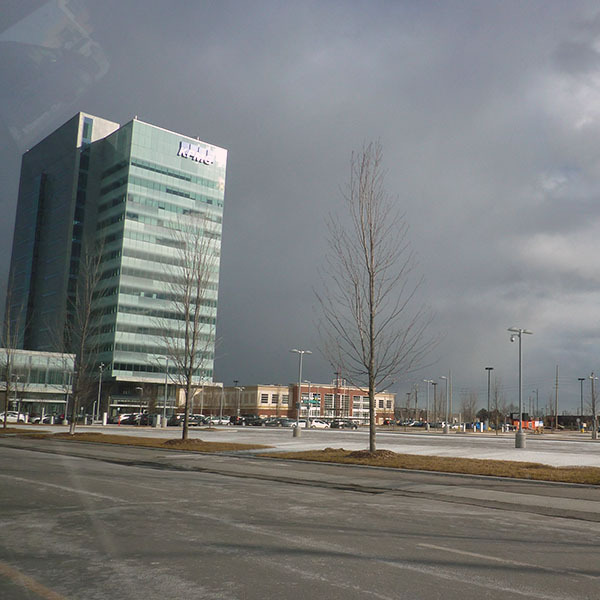 Vaughan is a suburb of the Greater Toronto area. The ambition for Vaughan Metropolitan Centre is to create a human-scale, highly liveable, attractive, clean, vibrant and successful urban area. The intensification of the area will be supported and driven by an extension of Toronto’s subway and bus rapid transit. Residents will have access to a high range and quality of goods and services within walking distance of their homes. Employment, like many highly successful urban areas around the world, will draw in and support the wider Greater Toronto economic area. However a principal barrier to arriving at this “human-scale” goal is the need to make the centre denser. To move from the current needs and expectations of public and business alike that buildings are accessed by car and lifestyles and living choices are such that there is little alternative to this model. Should the city transition too quickly, and parking provision is seen to be too restrictive, developers may hold off based on tenants’ access to labour concerns; residents with established car-use patterns will shun residences without parking. The growth and ambition will falter. Assessment of the demands for parking over time provided quantification and evidence to set out a parking needs roadmap. This roadmap is specified to provide adequate parking to support continued investment in the city whilst laying the foundations for the fundamental changes required to travel behaviour, mode choice and land use. Moreover the roadmap allows expectations and requirements for the city’s inhabitants, businesses and visitors to develop and transition as the city reforms towards its vision. The City of Vaughan must lead, but must do so at a pace, and in a strategic way that takes developers and residents with it. Therefore plans were developed that addressed the “now” while understanding and having a clear vision of not only of the “then”, but also “when”. Consulting advice has been structured around time horizons. By December 2017 the new subway station at Vaughan Metropolitan City (VMC) will open and a key element of work was to quantify forecast car-commuter demand. This has supported structured policies and actions to establish the desired safeguards so that this demand could be accommodated in a productive way in the short term but would not compromise their downtown ambitions in the longer term. 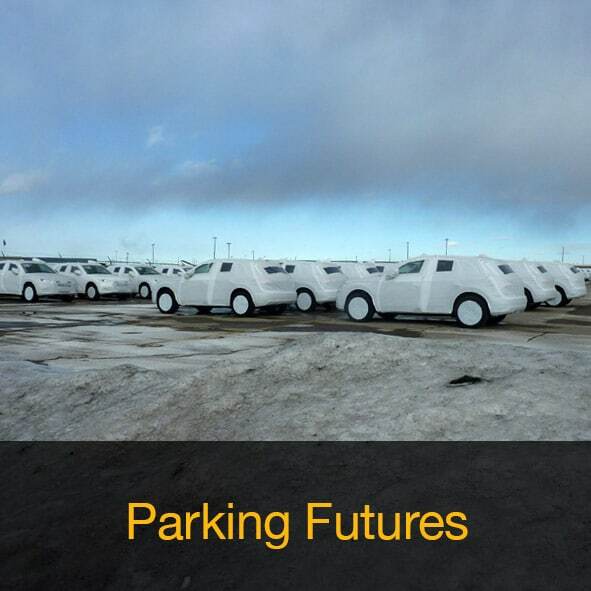 Parking demand forecasts based on city build have also been provided for a near-term (2022), medium term (2031) and long term (2051) time horizon. The commission has included workshops with major stakeholders including land owners, tenants and developers within the city. An imperative of the approach is to determine recommendations that work for developers and those investing within the area in a way consistent with the longer term vision. Modelling of land use for each parcel, block and neighbourhood has allowed demonstration of the balance of parking provision to supply and additionally experiment with different levels of parking standard and adoption by developers of payment-in-lieu (PIL) options. The key conflict is that if the PIL is set too high, it renders development in the city too expensive or developers elect to provide all parking on-site. This either means development is thwarted or the type of development is inconsistent with the longer-term downtown high density vision. Where the PIL is set low, adoption by developers will be high but funding for the city to provide parking off-site may be insufficient. The final report and recommendations will be delivered in the summer of 2017. At the end of February this year the British Retail Consortium issued its report “Retail 2020: Fewer but better jobs” (BRC, 2016). The study forecasts that there could be up to 900,000 fewer jobs in retail by 2025. This was in part due to the increased national living wage that would accelerate changes that retailers will be required to make to mitigate rising cost pressures. The national living wage is probably just the latest pressure on retailers. There is an on-going structural change in shopping behaviour that has been identified and commented on for some time. The Distressed Town Centre Property Taskforce, reporting back in 2013, considered the combined forces of economic downturn leaving people with less money to spend at a time when the availability of the on-line shopping became largely ubiquitous, changing not only the market share but also the way people shop as well. 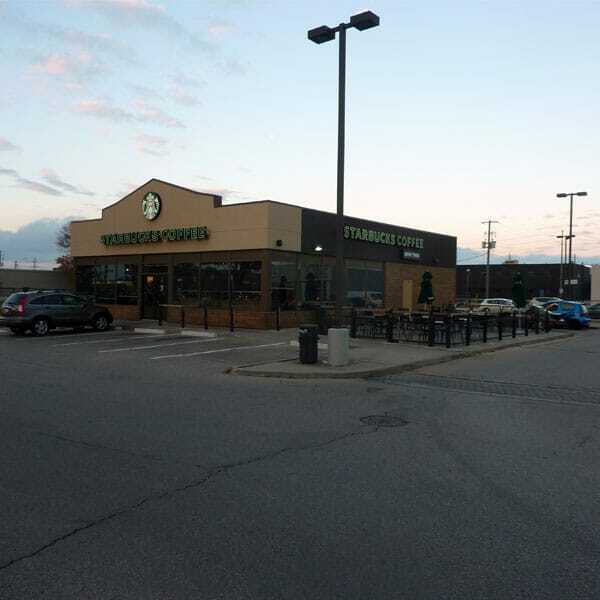 This has led to there not only being too much retail floorspace overall, but the smaller fragmented units found in town centres not of the scale that were offered in out of town locations and that the major multiples were looking to occupy. Research at that time from the Javelin Group suggested that by 2020 the impact of declining in-store sales would result in a loss of 31% of High Street stores. The BRC report does little to change that position. Their research shows that the retail industry is facing a significant uplift in costs. On top of the increased wage bill from the National Living Wage, retailers can expect increased business rates and additional costs from the apprenticeship levy. For the larger retailers, falling technology costs will offer scope to reduce headcount through automation and other productivity improvements across the supply chain. The concern is that for the smaller retailers such options may be more limited. With a large number of retail leases reaching their term in the next five years, BRC predict a significant reduction in those being renewed. 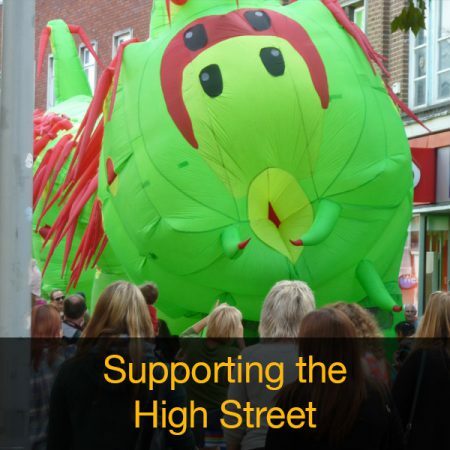 Moreover they consider that the impacts will be focused in High Streets in the weaker economic areas; High Streets able to model themselves as higher-end destinations may find themselves largely untroubled by the rising costs of business or structural change. What is perhaps key for the business community is to recognise these structural changes and pressures as the principal drivers behind the diminishing viability of their traditional retail centres. This is pertinent to parking within the town as often it is perceived that the parking offer, and in particular parking charges, are fundamental and responsible for the decline occurring. When 127 shoppers were asked in 2013 in St Helier, Jersey, why they had used the internet for their last on-line purchase rather than coming to the shops, 83% gave as their primary reason that the item was either not available or the range on the internet was better, or it was less expensive on-line. 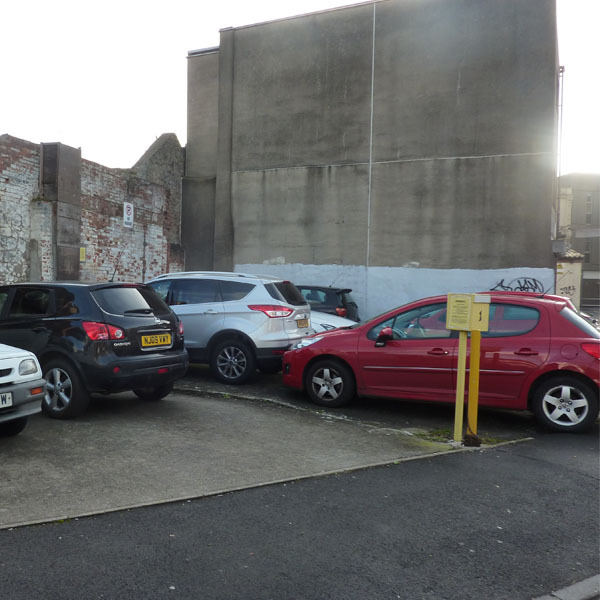 Despite both being available options, no-one in St Helier said that their primary reason for not using a bricks and mortar shop was because of the cost or parking or lack of parking (Potter, 2014). Undertaking the same questioning about out of town shopping, the people of Grimsby provided a similar theme. 77% chose out of town because of availability or range. The cost of parking continued to be a small factor. As seen with on-line sales, the extended opening hours proved to be the next most important factor. Amongst other options the cost of parking did not feature highly. When asked directly the more specific and leading question as to whether free parking in the town centre would have changed the purchase from out-of town to town centre, a larger number said it would. However twenty eight out of the forty (70%) responding said it would not. 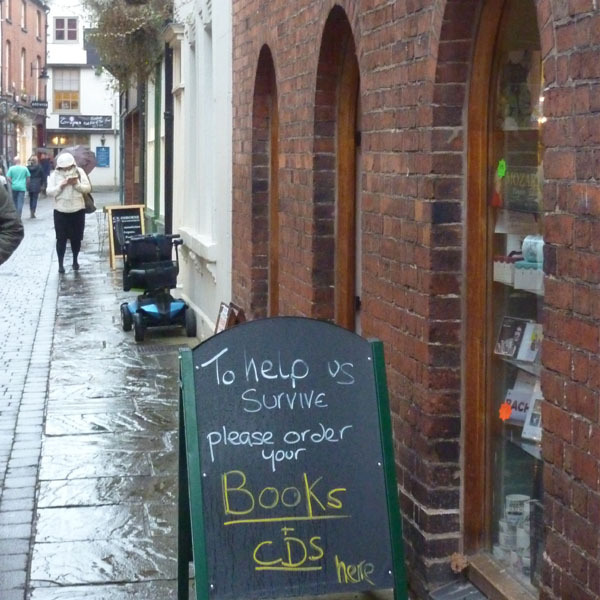 So is parking policy irrelevant to the survival of the town centre? Parking availability will remain a key part of making a town or city centre attractive to those that want to drive. But parking, and access by car must be put in context. Good parking, perhaps lower prices may influence a few. If people want to go somewhere however the cost of parking is generally little more than an after-thought. It may be a grudge payment, but it doesn’t immediately change destination choice. If town centre shops are closing, it is unlikely that the parking charges or availability are the cause, nor the solution. In many towns and cities the on-street parking tariff in the commercial core limits stays to one or two hours. Charges are however low and are competitive with off street parking. This can create a situation where demand for the on-street parking is greater than the available supply. In some cases on-street parking is uncharged but time-limited. This creates a common situation whereby drivers seek on-street parking first, and may persist in searching for it, causing congestion and personal delay. A preferable situation is for car users to select an off street parking location first and to park on street only if they have specific needs to be close to their destination. Current practice states that a desirable occupancy rate is typically around 85-90% for on-street parking. 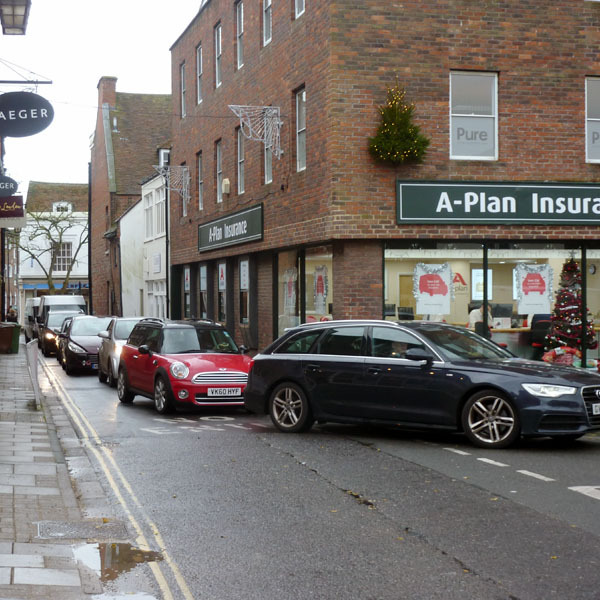 This creates the optimal balance between ensuring that those wishing to visit shops and businesses can find somewhere to park while maximising the remaining use of roadspace for those that are already in town doing business. The cornerstone of Performance Pricing, the concept promoted by the economist Becker and more recently Shoup, is based on adjusting the tariff paid to park based on expected demand to achieve the 85-90% occupancy at all times. At times and locations that demand has historically been high, the price to park is increased and where there is high availability, the price is reduced. Locations that adopt Performance Pricing do not change the tariff in real time. Changes are made at set times at regular intervals based on historical data. These changes are advertised and are incremental to progressively bring about changes in use. In San Francisco performance pricing was introduced in pilot streets in 2011. The tariff was adjusted every two months in response to measured occupancy for the preceding period. Where occupancy was seen on average to be above 80%, and thus empty parking bays limited, the hourly parking tariff was adjusted up by 25c. If the average occupancy was lower than 60% the tariff was reduced by 25c or if lower than 30%, by 50c. For those blocks with an average occupancy between 60-80%, no change was made. 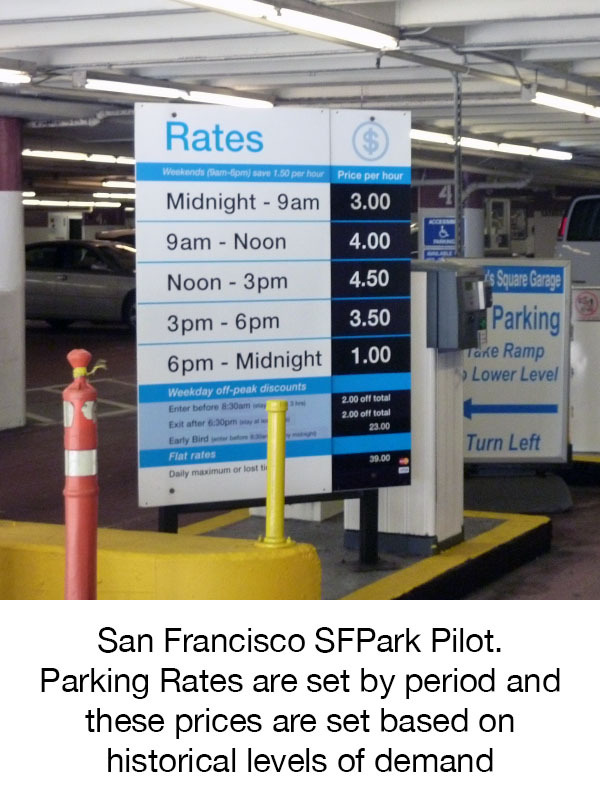 While San Francisco used parking bay sensors to determine parking occupancy there are a range of lower cost solutions being used in other cities and under development to establish a measure of occupancy and thereby inform price changes under Performance Pricing. 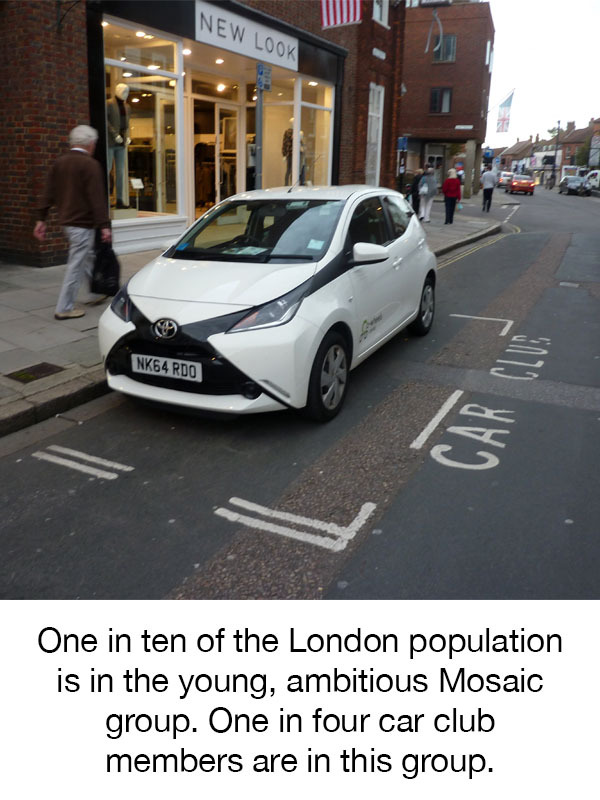 A solution for towns in the UK may be to introduce performance pricing or its concept for its on-street parking. In essence a measure of ideal occupancy is determined for each location (typically 85% but there is evidence to suggest variations on this are sensible) such that there is always availability. Observations are made (or accumulation data collected) such that the tariff for the car park is periodically changed to achieve the ideal occupancy for different time period across different days. Many locations in San Francisco have gone down in price compared to before Performance Pricing was introduced. In Los Angeles, performance pricing has seen overall revenue increase by less than 2% since its introduction. Once the rules are agreed, it is demand that sets price. This negates any accusations that the price has increased to address some budget shortfall. Ultimately this approach ensures availability which has been shown to be key for shoppers. A user that wants to go into town and park at a particular location to pick up a washing machine knows that they will get a parking bay near the place they need to. They know that the cost to park at that location may not be the cheapest available, but it will be available and for them is the best option given their needs at that time. Overall however, regardless of how good the parking offer, travel, and subsequently parking, are derived demands. They arise because of some other activity. In terms of the commercial viability of a retail area, “the success of a shopper’s car park is entirely a function of the success of the tenants in the centre. A very successful centre will generate more traffic and hence parking demand than a similar sized centre with poor tenant mix” (Keilthy 2002b). Twenty or thirty years ago the town centre was the focus for shopping activity. The availability of goods offered, the range and price, was then as it is now, important. Those visiting a town centre by car or other modes, sought convenient access. 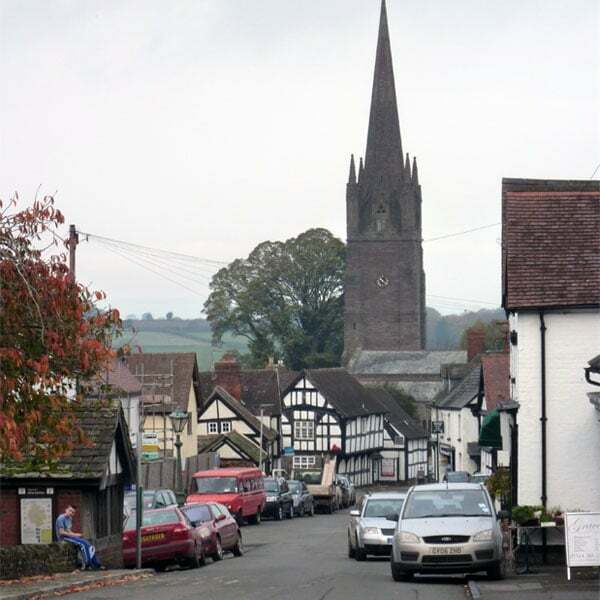 The town centre was characterised by the sale of goods. In recent years, the sales of goods and in particular the sale of larger goods, has moved out-of-town. More recently the internet and home delivery has become a significant market-place for the direct purchase of goods. For those towns that have seen increases in urban living, the proportion and frequency of those accessing the town by non-car based modes has also increased. Moreover, the town centre is increasingly less of a destination for buying goods as much as somewhere that people spend time and leisure. It is itself a destination. They go there for the experience. Retail space that once sold hardware or other everyday goods is now selling services in the form of nail bars or hair salons. The High Street has seen a change of use to restaurants and coffee shops providing the urban fabric for people to relax, socialise and enjoy leisure time outside the home. While the High Street has and will see significant decline in its current form, as a destination to a new kind of experience it offers something different that is not necessarily provided elsewhere. This new form of service industry also presents considerable promise for the local economy. Money spent in coffee bars or on services may be able to achieve higher margins than more competitive comparison goods shopping. Also, because a larger proportion of the sale price is consumed by staff wages, more of the money spent stays in the local economy. The over-riding change is that more people are coming to the town centre to spend time. For those destinations offering the right environment, entertainment and quality of service, dwell times are increasing. Late in 2016, Brent Cross shopping mall in North London unveiled a £1.4 billion plan to upgrade its offer. When Brent Cross opened in 1976 it had just two cafés on the site. When the upgrade opens in 2022, it will have as many as fifty food options including street food stalls in the main thoroughfare, a cinema complex and a hotel. Recognising that shopping centres are destinations to spend leisure time, opening hours are expected to extend as late as midnight (Evening Standard, 2016). Recognition of these new trends in how people spend their leisure time is influencing the increased prominence and quantity of food and beverage outlets in shopping malls as well as the linkage at the mall to restaurants, bowling, cinema and other entertainment facilities. There are trends with technology that may also improve the efficiency of parking sites in the town. In particular, the emerging technology that enables cars to self-park without a driver offers a reduction of space needs per vehicle of over 15%. Not only is there no need for doors to be opened once the vehicle is in its parking spot, but some aisle widths may be reduced. A progression into Autonomous Vehicles, even if not operating on the public highway, could be used within the controlled environment of a car park. Such an arrangement will not only reap the capacity efficiencies described for self-parking, but within parking areas explicitly designed for AV access only headrooms could be lower, ventilation and lighting reduced. Indeed, AVs that submitted to a central local controller, could double park, re-arranging themselves as necessary to release specific vehicles when required. The longer term expectation is that the AV will see a reduction in parking demand in the more expensive town and city centres. Recent modelling indicates that AVs will drop occupants off in the city centre and then re-locate to the periphery of urban commercial areas to park in lower cost locations (Zhang 2017). The AV may also spurn a greater use of shared mobility. The Shared Autonomous Vehicle, be that a vehicle that collects multiple trips on the same path like a bus or a vehicle that provide contiguous trip-makers with their own personal travel, like a taxi, is expected to make this option very affordable for users. With a growing reduction in the need to own a personal car and reliance on an extensive network of readily available SAVs, significant areas of land currently occupied by personal cars that are used for only a few hours each day would be released. A report by WSP|Parsons Brinckerhoff & Farrells in 2016 has estimated that 15% and 20% additional developable area compared with a typical central urban layout will be achieved. 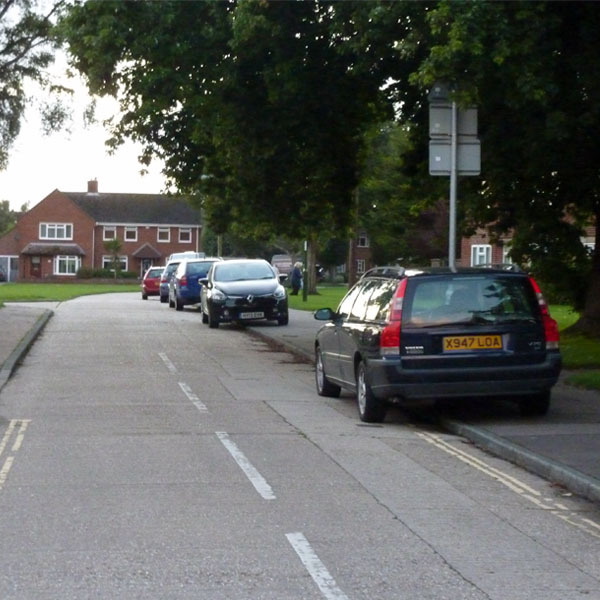 Many residents will re-instate front gardens where currently they have hard-standing for their vehicle. A key question for a regenration strategy to increase town centre living is how we address demand for parking by residents. For those already living within the town centre, or for those attracted to do so, there are a number of considerations that relate to the provision of parking for residents. Mitigating the impact of parking and traffic on the neighbourhood is also fundamental to ensuring a quality place to live. At a planning stage, many authorities across the world apply minimum parking standards to new developments. Even within the UK, the global pioneer of maximum parking standards, there is retrenchment to minimums for residential sites. 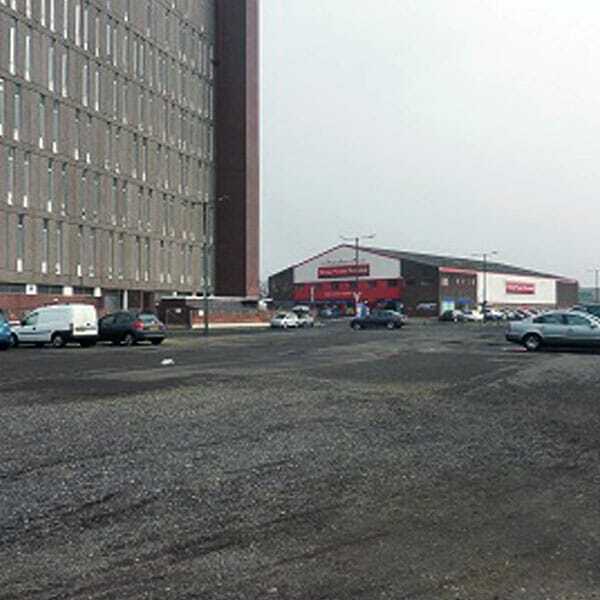 This requirement to include land for parking as part of the development means that the overall cost of the residential unit is increased by at least the cost of that car parking provision. 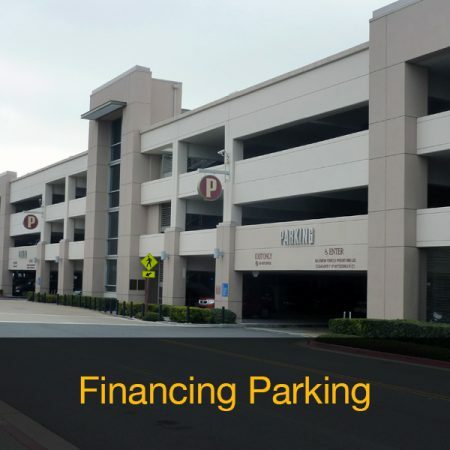 Whether a prospective owner has a car or requires off-street parking, they are intrinsically required to purchase not only the residence but some aspect of cost from the requirement placed upon the developer to provide a minimum amount of off street parking. The philosophy of bundling parking requirements into developments is based on an expectation that if residents are not provided sufficient personal off street parking then they will place a burden on their community by parking the cars that they own inappropriately. The “overspill”, that parking demand not accommodated within the curtilage of the residential properties, will become a burden on nearby streets and cause nuisance. This philosophy embraces a key assumption that a developer must provide the parking capacity because those that purchase the property will probably own a car. 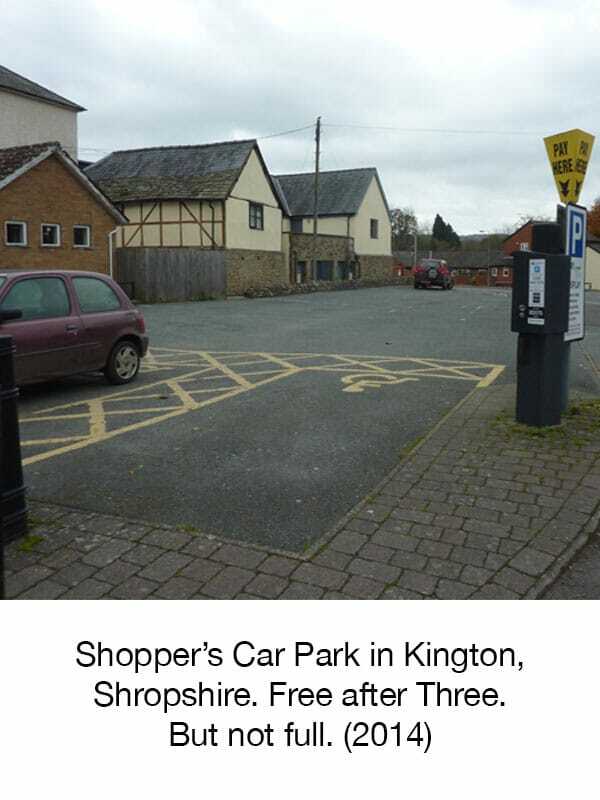 Without their own parking, the responsibility for providing somewhere for it to be stored when it is not in use will fall to the community and then onto the local Council. Those residents will complain that there is no-where for them to park their cars near their homes and the expectation is that the Council must invest wider public funds to provide additional capacity and address the problem. In Japan, cars cannot be licensed until the buyer has demonstrated that they have somewhere to store the vehicle overnight that is not on the public highway. Vehicles left on the highway overnight are removed. Many residents with cars lease parking from third party providers. What is key is that the responsibility to find adequate storage is clearly that of the owner of the vehicle, not the state or local authority. Developers are thus not required to provide on-site parking if they deem that there is a market for those residential units without parking. 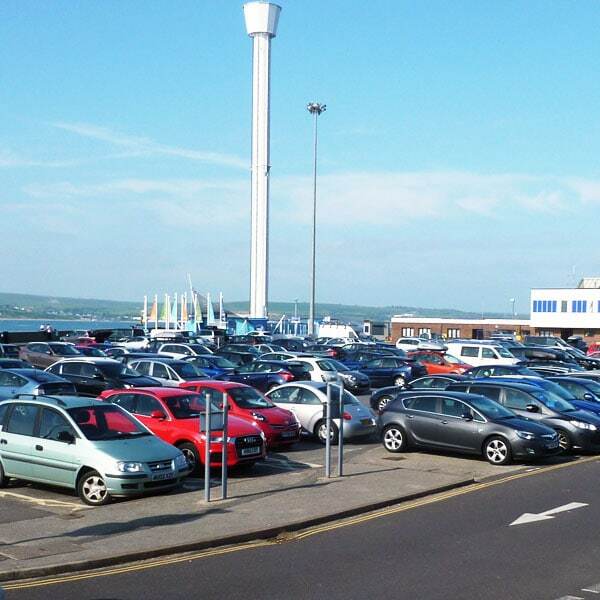 Within urban areas, and within Weston town centre, the cost of providing parking within the site can prove considerable. Providing the option to not require any parking minimum standard thus offers residential units that are more affordable. 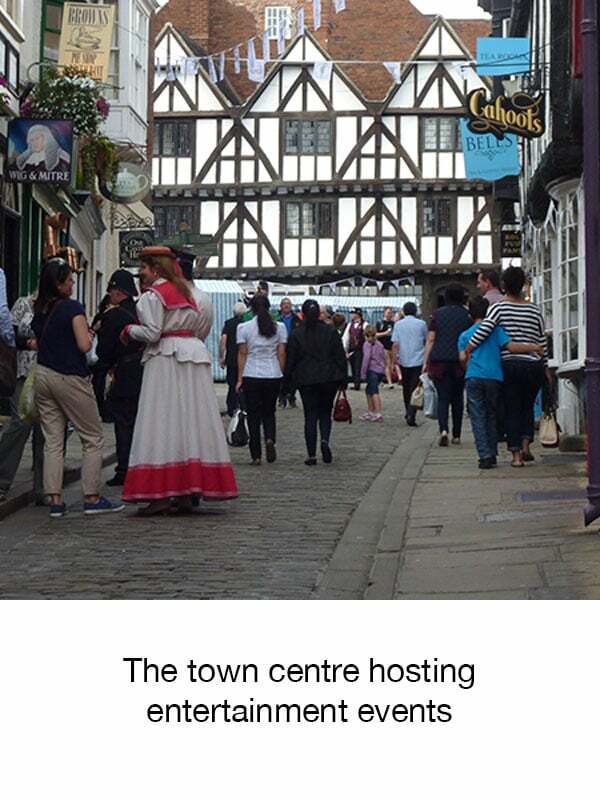 Bringing down the entry cost of attractive historical apartments within the town centre thus supports the ambition to increase the number of people living and owning residential property in the central area. 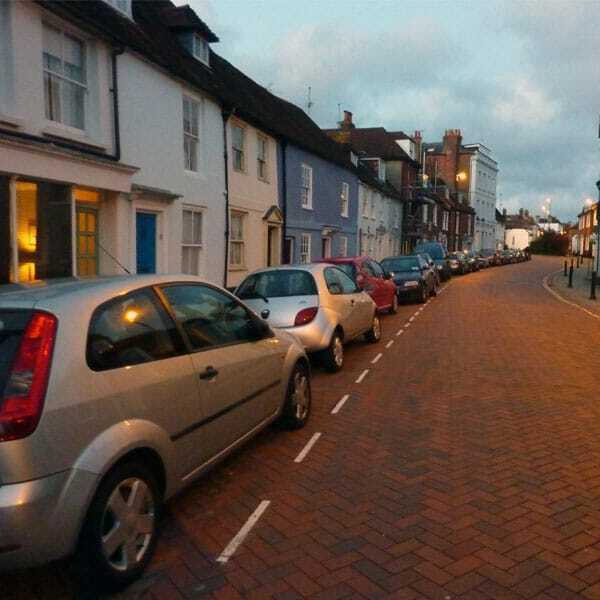 Minimum parking standards are created to avoid parking overspill. An alternative policy is to establish clear regulation with respect to the management and acceptability of parking in the local community and streets. Properties that do not have their own parking may be permissible. This may make more sites viable for development and/or reduce the cost of purchase. Those that select to live in those properties are free to make their own choices about car ownership and the consequent responsibilities to provide or lease adequate parking for it. To enable redevelopment of potentially marginal sites and based on the expectation that town centre locations may appeal to those without cars, this is the approach taken by North Somerset within Weston-super-Mare. There is good reason why this approach may be appropriate. There are significant indicators that the trend for people to own cars is diminishing. In London there are already over 186,000 members of car clubs which have 2,500 cars across the capital. Trends indicate that there will be 1,800,000 members by 2020. This change is significant because of its impact on car ownership. For each car club vehicle, members sell or dispose of more than 10 private cars and defer the purchase of 22 cars. Car club members have reduced their car mileage. Their travel distance by train and cycle is almost double the London average. (Carplus Annual Survey of Car Clubs 2015/16). Ambitious young people in their 20s and 30s are Metropolitan High Flyers in the Mosaic classification. One in four car club members is in this Mosaic group. This compares to only one in ten of the London population. 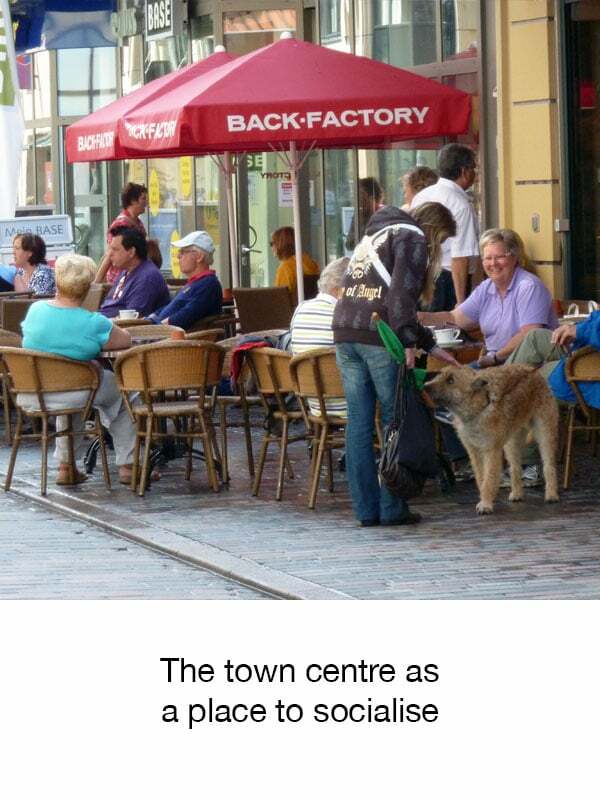 The indications are clear that this group, that would be a key section of society to attract to Weston as part of the ambition for a wider demographic and gentrification of the town centre, are accepting of and potentially attracted to living and mobility that does not necessary consist of, or rely upon, car ownership. Technological change is also expected to drive significant changes in how people travel. Recent research estimates that one Shared Autonomous Vehicle, operating throughout the day, would effectively replace 9-13 cars (Fagnant & Kockelman 2016). The indication is that new mobility, which includes the services provided by providers such as lyft and uber, are reducing the advantage of personal car ownership. The combination of mobile devices, efficient linkage of location data between users and suppliers and the seamless billing process have made personal and on-demand travel very accessible and affordable. The transition is not limited to personal motor travel. Improvements in real-time data availability and the technological ability to be able to process a wide range of suppliers providing transport into a simplified set of travel solutions for the user at the point of use means that bus services and other regular transport modes become more accessible and understandable. The step-change in mass real-time data processing is also facilitating a rise in options to pool or share travel (where lower cost travel by taxi is provided based on the ride being shared with other users seeking to, or already travelling, a similar direction). This consolidation of all options is developing into what is being described as “mobility as a service”. It is expected to result in one common consolidation portal or mobile app creating and offering not only the best set of options for users across all transport modes and services available, but providing and using reliable real-time information on the status of public transport in selecting that option set. In practical terms, taking a bus will not consist of waiting at a stop, not totally certain of its reliability or punctuality. With real-time information provided through the consolidation service, users will be able to select the best service for them based on all the transport options available and if a bus is selected, know when to walk to the bus stop so as to arrive as the bus does. The principal dis-advantages of reliability, uncertainty and clarity of public transport will diminish. In parallel, increased values of land and space within successful urban areas could make the availability or cost of parking personal cars progressively less attractive. This type of change in lifestyle is evident in the Parcmerced residential development in San Francisco. Tenants are provided $100 per month travel credit to not own a car. This rebate is essentially funded through the higher development densities being achieved on the site due to the reduced requirement to provide parking space. A similar initiative was announced in the UK in June 2017 by Moda Living. They plan to provide tenants £100 per month in Uber credits if they do not require a parking spot. There are evident trends that people are seeking a different lifestyle and it is important that the development and regeneration of the town centre is not constrained by a requirement to accommodate car storage. 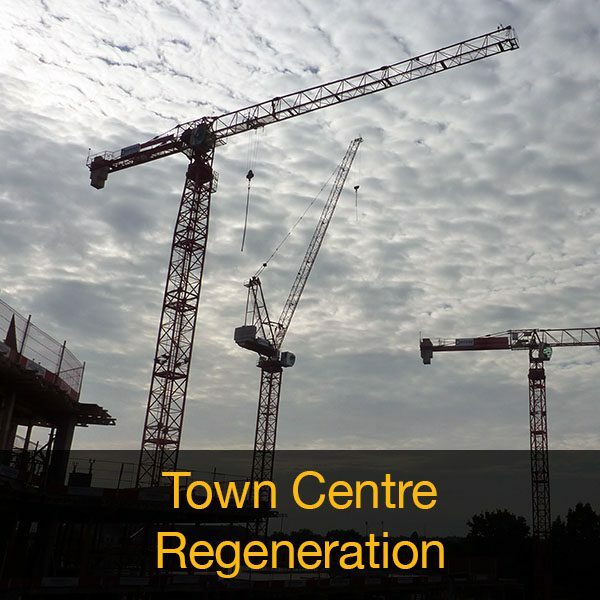 Councils seeking to re-gentrify and regenerate their aged centres may wish to encourage people to buy, live in and renovate town centre dwellings for owner-occupation. Part of this equation is making that choice affordable and not necessarily adding car parking provision where this creates a burden of costs. There are emerging alternatives to car ownership. While for many, car ownership may form an essential aspect of their daily lives, there is a potential number of people who will embrace and seek a contemporary lifestyle that does not rely on car ownership and places other factors, such as the quality of where they live, over access to their own car. Wherever residents elect to own cars, they must understand that it is their car and thus their responsibility to have, or pay for, somewhere to store it. Based on this approach, Councils can proceed with regeneration of the urban centre and encouraging higher density living with clear controls and policies on how and where residents’ cars are parked. 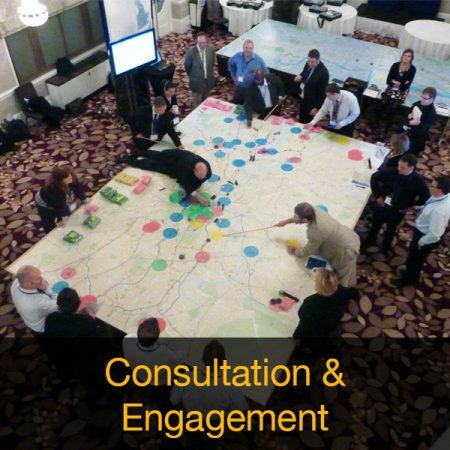 Consultation and engagement can be an essential component of a successful assignment. It is in our best interest to understand and integrate the interests and opinions of those who will ultimately be planning, implementing, managing and using the infrastructure that our clients deliver. A good consultation and engagement programme will aim to provide the political representatives, stakeholders and staff with opportunities to contribute that are accessible, creative, informative and meaningful and ultimately help shape a good solution. We aim to make our consultation informative and interesting – this means that we are providing options for stakeholders to give us their feedback and input and it is also an education for all parties, in particular us. We can provide technical expertise but it is also critical that we understand the end users’ needs and equally important that we understand economic, political and legislative issues. At times, a consultation plan can focus too much on providing people with information as opposed to engaging them. Effective discussions can be scheduled on a one to one basis. This allows representatives time to discuss specifically the issues that matter to them. Wider sessions, such as workshops, offer a good vehicle to provide attendees with information and facts while also giving them an opportunity to engage in activities that gather their input. We have experience of using this format of a short presentation followed by debate in many circumstances, to good effect. There is enormous scope to do a lot with the existing and readily available data provided by ticketing machines and entry/exit counts. Where greater insight into behavioural choices is needed and travel patterns it may be necessary to undertake a suitable survey. Good survey and sampling plans need not be expensive; the questions to be answered need to be clear and the process designed to be efficient in that goal. An example were the series of small surveys with the public undertaken in October 2013 in St Helier. 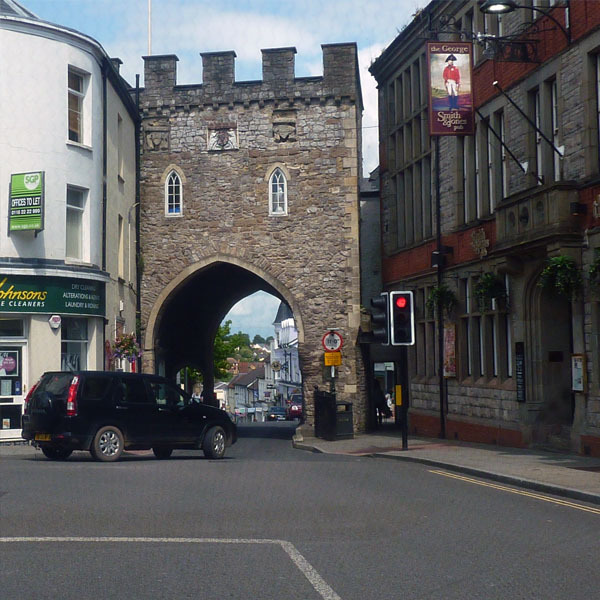 The survey results were combined with other available datasets to provide a first step estimation of the impact of waiving the town’s parking charges as a method to stimulate retail trade. 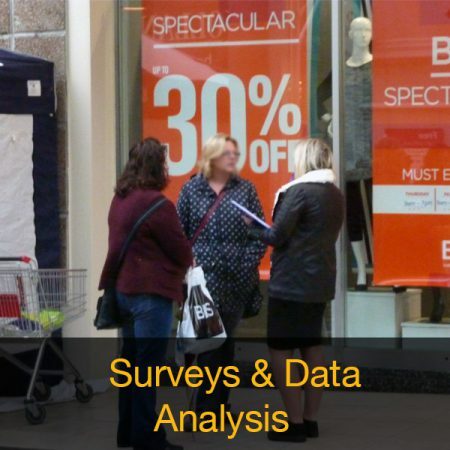 The survey design estimated the likely benefit impact on retail sales in St Helier as well as the wider costs and consequences of the measures being proposed. 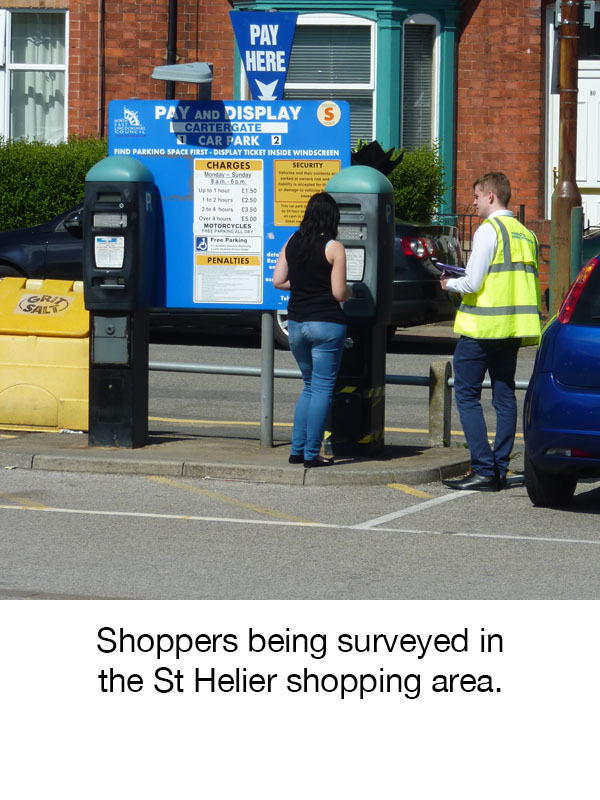 Shoppers being surveyed in the St Helier shopping area. Very quick trip end, purpose and origin surveys undertaken at the ticket machine may also be very effective at adding significant richness to the extant ticket sales data. The combined datasets not only underpin analysis of parking location choice but provide evidence of modal choice and attitudes towards pricing policy in car parks. We have considerable experience designing and executing attitudinal surveys not only for parking but also by extension for users of transit and public transport services. Surveys may be undertaken while users wait for the service or a very cost-effective alternative that we have used relies on self-completion on-board managed by travelling survey staff. 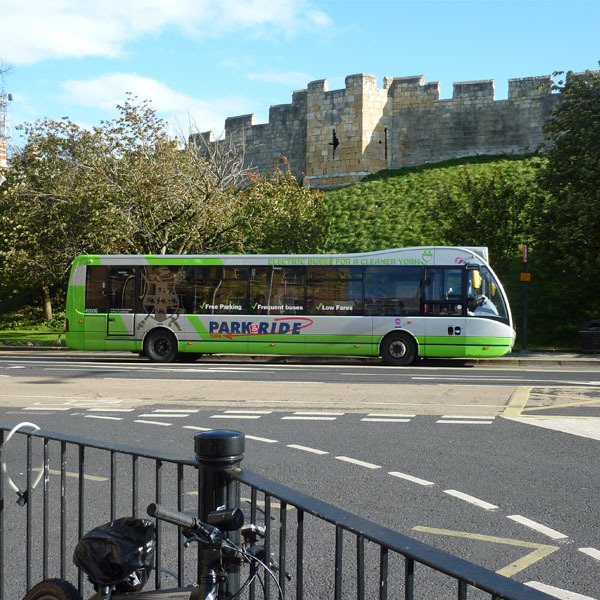 The post-opening Park & Ride surveys undertaken in Chelmsford were undertaken on -board and achieved a capture rate of over 90% of all users. Amongst other responses, the survey confirmed that the majority of users were attracted to the park and ride because it was ‘cheaper than parking in Chelmsford’. The survey gathered users’ home postcodes which not informed the reach of the service but was instrumental in estimating the congestion relief the service provided on key approaches to the city centre. Simpler non-intrusive methods of survey can also be applied efficiently to quantify and understand the scale of issues such as on-street commuter parking in residential areas. Where a local authority does not currently collect parking payments, the near future offers a number of options. This method is tried and tested and understood by the public. It is relatively easy to enforce and presents the default choice. It requires notable installation costs for the associated street furniture and these require on-going maintenance. In most applications the machines acquire cash which presents risk on-street, incurs collection costs and requires measures to prevent leakage. The City of Westminster operates cashless payments for pay and display by credit and debit card only. For users, the major drawback is the requirement to have appropriate change and requirement to pre-determine the length of stay. In the commentary that follows, other options are typically compared to pay and display. This system uses prepaid cards that are validated for the time and day of use by scratching away the hour, minute (to nearest 5), day, date and month from a printed card. Each voucher has a preset value that buys a given time for on-street parking. The time purchased for a voucher may vary in different zones (system in St Helier) or different denomination vouchers may be in use (Chichester). vouchers cost a few pence each to produce and are sold through local newsagents and garages on a commission basis. Cash handling is therefore undertaken by these agents as part of their standard retail operation; the authority sells the vouchers in bulk and on account to these agents which reduces opportunities for leakage. The process presents a position of being able to earn the revenue in advance and there is inevitable value that is not redeemed by users through vouchers being lost or taken out of the area. Vouchers are generally unattractive to thieves as they are not readily traded and when in the hands of the public are distributed in users’ vehicles such that (unlike payment machines) there is no concentration of value. Tariff changes can be effected remotely through a simple change in wholesale rate and publication of future charge. Fraudulent production may present a risk. The system presents an initial barrier to use for visitors. However the overwhelming number of parking transactions within most towns will be by frequent and local users. The limited up take of voucher systems are perhaps due more to it being unfamiliar in the UK and perceived to be old technology. 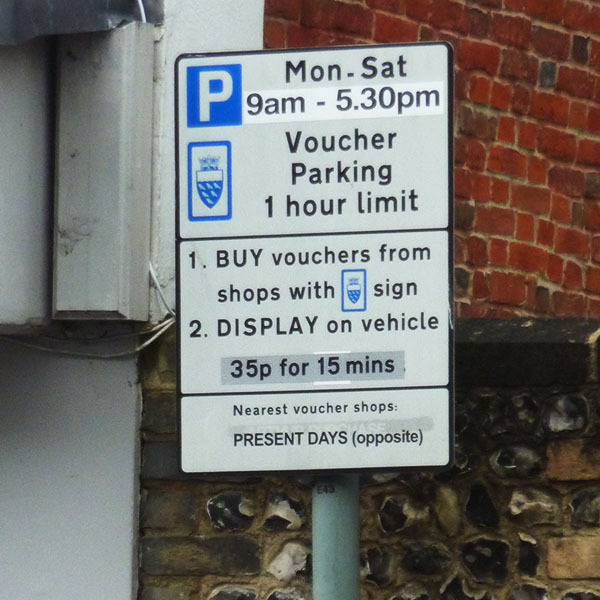 Good practice is for the parking signs to inform users the name and address of the nearest outlet selling the vouchers (shown in image in Chichester). The scratching of the vouchers is somewhat tiresome for users, and having the right number or mix of denominations may prove problematic. 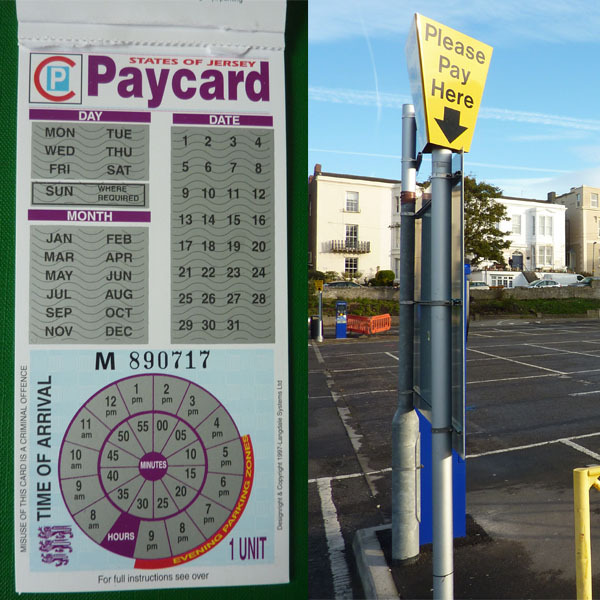 Like pay and display, the voucher method is restricted in that it relies on users to declare in advance the length of their parking stay. 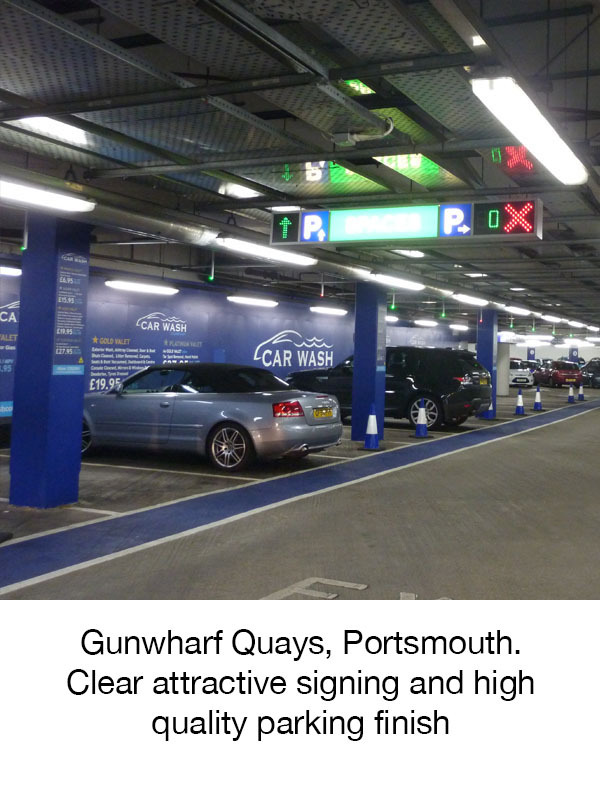 The prevalence of pay on foot systems in large retail car parks demonstrates the popularity and commercial advantage that this method affords over pre-determined payment systems. It is geared towards off street car parks with barrier control, with an entry ticket being validated for use as the entry ticket once the stay is paid for at a central pay-station. 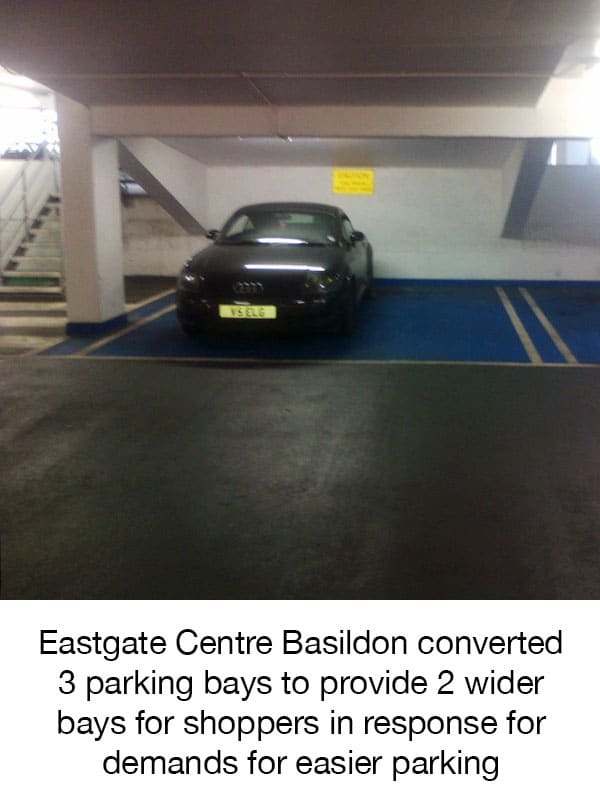 The major advantage for users, and why it is popular in shopping mall car parks, is that there is no requirement to pre-determine length of stay. 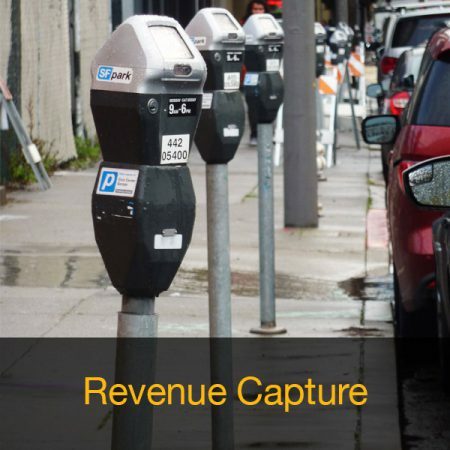 A common approach in many major cities is the emergence of pay by phone accounts for parking. This includes payment by apps on mobile devices (which now make up a greater share of use). Users are billed against a credit or debit card account. A third party operator provides the service for a limited fee which may be absorbed by the operator or passed onto users. Vehicle parking time is purchased against the Vehicle Registration Mark which is passed to the enforcement team. The system removes cash and by creating a back-office accounting process enables the tariff charged to use tariffs unbounded by the denomination of coinage or user familiarity. Tariffs may be set as fractional pence per minute if required, can be differentiated by time of day and location and can readily be linked in to a process of reward and rebates based on account holders’ activity or other specifications (such as being registered as a resident in the area). The initial account set-up is a barrier to users and there may be some initial resistence from users to switch to the system. Compared to pay and display, pay by phone/app offers significant user advantages. It addresses the pre-determination difficulty for those uncertain of their duration of stay; the operator will send text messages to users reminding them when their paid duration is due to end and, subject to the restrictions in force, offer time extensions to be purchased. In 2006 cash was the only means of payment for on-street parking in Westminster. A pay by phone pilot was initiated in October 2006 in 2 zones as a complimentary payment method and from October the following year rolled out across the city. Chip & PIN Pay & Display was also introduced as the cash meters were progressively removed. By May 2009 all means of paying cash for parking had been removed. By July 2011, 89% of all parking transactions were being made by phone. However the removal of the cash option did present some difficulties for specific users requiring the introduction of parking cards (or vouchers as used elsewhere in this note). (Fitsall, The Intelligent Kerbside, 2012). Despite the widespread availability of pay by phone in other areas it can remain limited in its appeal. Based on a survey in a number of major UK cities of over 2000 adults, only 6% reported using phone or text services to pay for parking (Xerox, 2015). ​Within Westminster users are also presented with the epay option which enables them to use cash at local shops. Once parked in any paid-for bay, users go to the nearest epay point retailer. They provide the retailer with the 4 digit location code of their parking bay, their vehicle registration number and the appropriate cash payment. ( Parking for Visitors, 2015) The retailer effectively provides the media interface otherwise afforded by the phone account. The attractiveness for user and operator of pay by phone is the back-office account. The electronic payment processing offers tariff and charging flexibility and for users removes the need to handle what are typically small cash values. The pay by phone process does however retain a requirement for the user to make the call or visit to the mobile app site and undergo progressive pre-determined payments for the stays made. Emerging technologies are proving the use of smart apps to enable a passive charging system based on mobile devices. Applications exist whereby owners of mobile devices (iphone, Windows phone, Android or Blackberry) can register their vehicle and payment account with third party providers and then park, select the parking location code (using the zone, a signed number at the parking spot or a map on-screen) and commence their parking. Once they have returned to the vehicle, the “Stop” button is pressed. Users can read their parking history on-line and are billed monthly. The ParkMobile brand and operation is present in over 500 cities worldwide including Birmingham and Leeds (ParkMobile, 2015). A similar offer is provided by Ring Go who are operating in over 160 UK towns and cities (Ring Go, 2015). The emerging evidence is that a seamless parking experience is imminent. 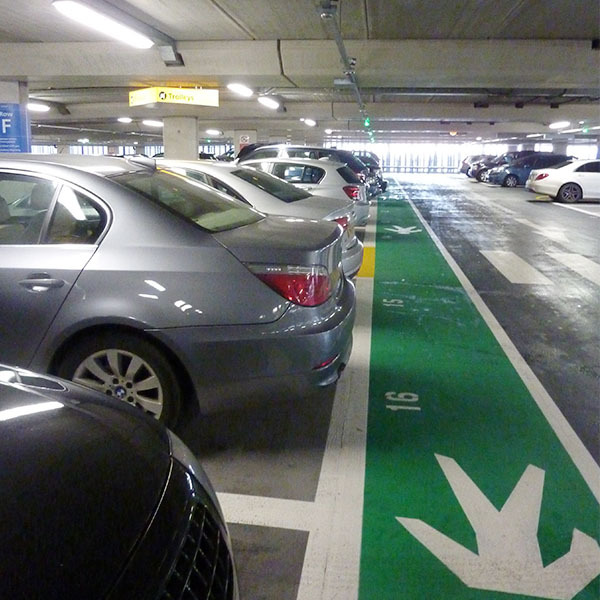 Pre-booked parking is also available and becoming more prevalent beyond the airport. 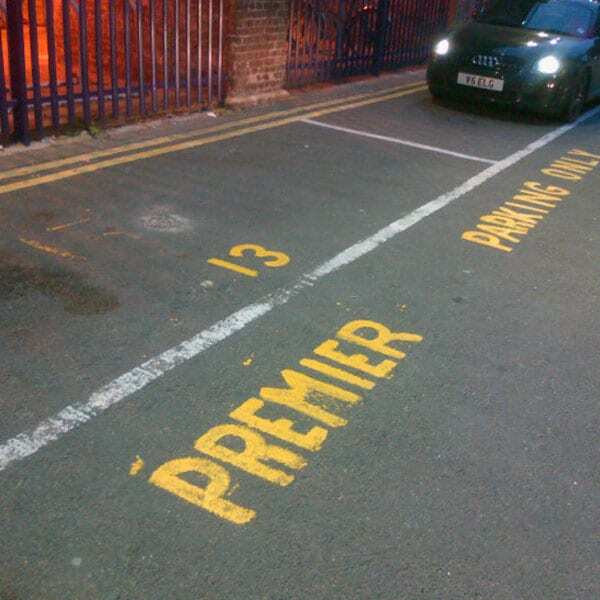 At underground parking locations such as Upper Street Car Park in Islington, cars that have been pre-booked and paid for their parking via the website are recognised using ANPR and granted access through the barrier. For those parking within the booked period, there is no further verification or payment, and departure is similarly controlled by ANPR. The retail vision currently sees that parking will become one component in the overall integrated and personalised shopping trip. Festival Place retail centre in Basingstoke have launched the “Festival Rewards” app. For those customers that sign up and input car registration and other personal details there is an ambition to enable parking to be booked in advance, a personal greeting on entry to the car park, remote billing with payment done back office from account, internal direction finding to a parking spot inside the car park, a mobile app fed with offers and information while in the centre based on location and activity and the potential for parking fees to be reduced by incentives and purchases. 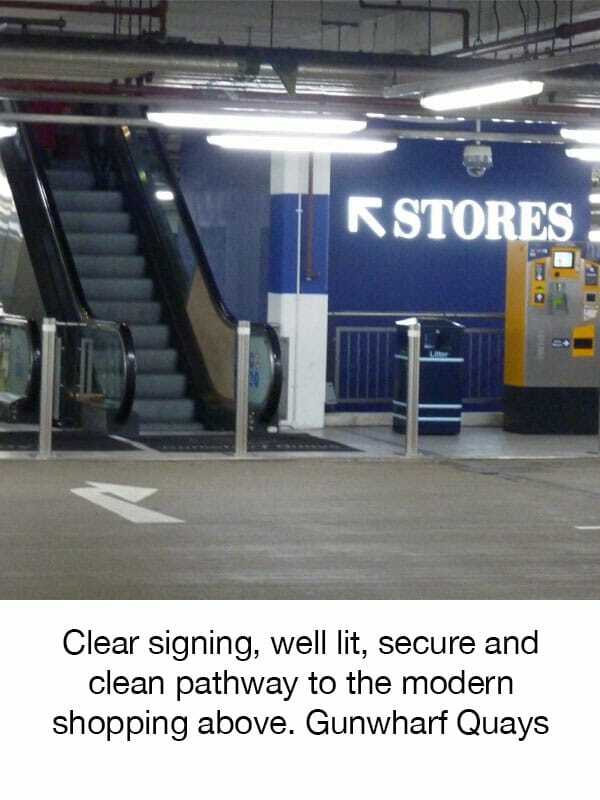 Goods may be delivered to the car or a collection point with parking payment acknowledged and communicated on departure and on-going correspondence and loyalty points/rewards for parking and shopping at that centre between visits (Murphy, 2015). The Bullring and Mailbox are pursuing similar approaches. Various manufacturers are already using and developing installed navigation and communication technology. In the near term we can expect to see widespread use of the dashboard as the portal for parking. Navigation and parking information are being combined to lead drivers directly to an available parking spot. (ParkMobile, 2015). 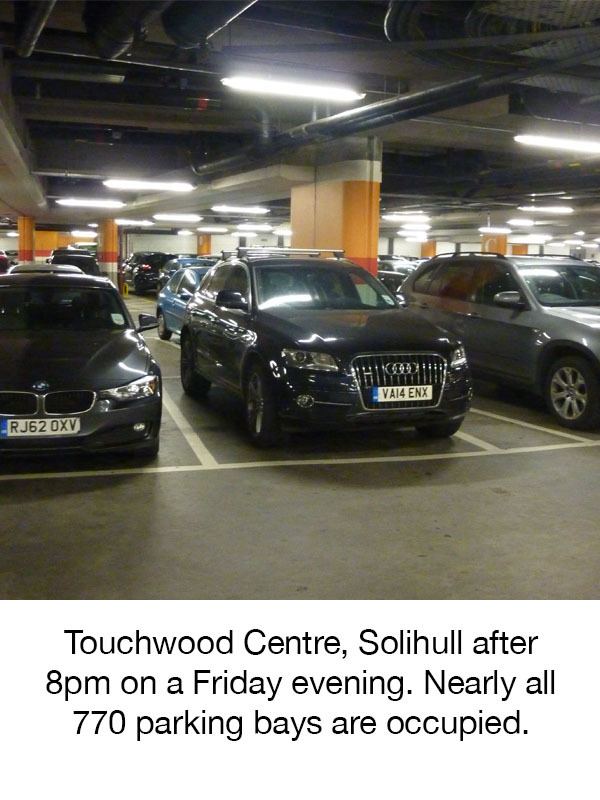 Notwithstanding the limited attention given to Variable Message Signs (or other knowledge regarding car park occupancy) by drivers that queue, we can see the physical installation of any device providing information on parking availability to be superfluous within the next 5 – 10 years. Recent European legislation (April 2015) requires all new cars and light goods vehicles from 1st March 2018 to have an in-vehicle eCall system installed (EU Regulation No. 2015/758). While the eCall system is designed for emergency use the on-board device will continuously track the location of the vehicle via GPS and provide the platform for other utilities. Thus all new cars will come with the capability to support systems linking vehicle location and operation with a parking (and toll) charge account. Despite the potential for users not to subscribe, the advantages to users that may be offered by automated navigation, occupancy and billing (by recording the specific length of time stopped in a charging location and providing warning where parking is not permitted) will likely see significant uptake of such services. This in turn will improve the richness of the data available to those managing and optimising the choice sets offered to individual users. There are thus a number of options emerging that will enable users to progressively link location or parking activity to an account for payment that will be passive and invisible to the user in the near future. For more users it will become common for parking charges to be consolidated and reported by way of a monthly invoice, with payment debited directly from an associated source account. BMW are one of a number of car manufacturers who envisage the in-car navigation process to include parking location selection and payment as an automated process for the user. This will make paying for parking a background activity, reducing the inconvenience of the transaction. Based on attitudes to other remotely collected charges, it is also likely that it will reduce the impact of the payment by not only separating the action from the cost, but by consolidating the individual costs into one larger electronic monthly payment. (Thaler, 1999). Thus the key conclusion is that on-street furniture and more traditional methods of paying for parking at the point of use could to a significant degree diminish in importance over the next five years. This may have a bearing on the life expectancy of any on-street equipment and the density of deployment, or indeed any decision regarding which payment mechanisms to introduce. The principal consideration for enforcement is that it should be proportionate and sufficient. 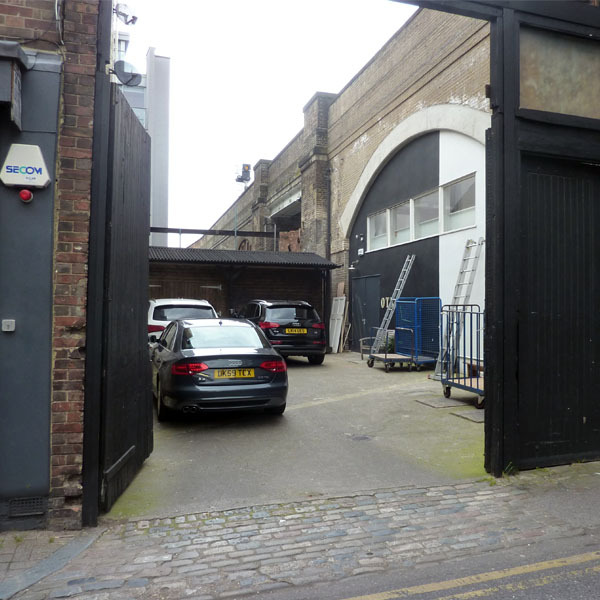 The emerging trends see a move away from civil enforcement officers undertaking a punitive role to job titles and descriptions that are designated to assist users find parking and provide a valuable way-finding service. 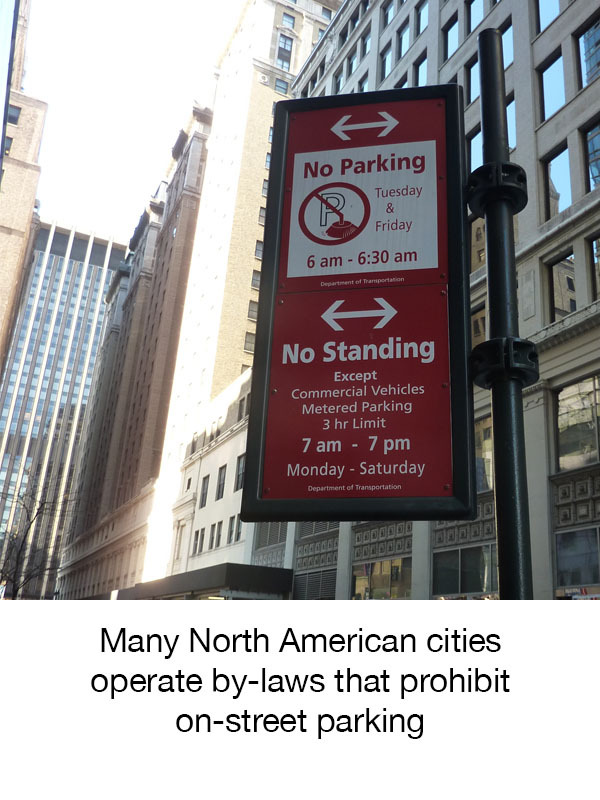 Evidence from San Francisco, Westminster and Auckland has supported the position that as time restrictions are removed for on-street parking, despite potentially the cost of parking increasing, compliance has improved. This supports the position that a significant number of infringements are not a result of an intention to breach the parking rules, but due to user requirements being unsatisfied by the prevailing rules or payment methods (especially through overstaying a pre-determined estimation of stay). Westminster saw a 50% increase in casual parking revenues from 2006/07 to 2011/12 accompanied by a reduction in the number of Penalty Charge Notices issued. This is ascribed to the easier payment methods provided by phone over finding sufficient cash for meters and the extended stay periods offered in some locations. (Fitsall, The Intelligent Kerbside, 2012). In advance of the ubiquitous inclusion of GPS capabilities within new vehicles, there are other more immediate options being trialled using RFID that open up new services for subscribing users. Over the longer term, linking the increased prevalence of locational accuracy of a vehicle will offer automated compliance in most cases and may ease the type and scale of enforcement required. Time restrictions and payment limits for individual events will be systemic and not require continuous enforcement; if a charge is being collected the system will be assumed to be making accurate and correct charges. Enforcement will move to addressing individual errors with the system or users that dis-engage from the automation to avoid charging. Build Operate Transfer (BOT): a contract with a private sector contractor to design, build and operate a public facility (such as a car park) for a defined period, after which the facility is handed back to the public sector. The facility is financed by the public sector and remains in public ownership throughout the contract. The key drivers under this model are the transfer of operating risk as well the transfer of design and construction risk. This model is particularly suited to projects that have a significant operating element such as a public car park. Design Build Finance Operate (DBFO): a contract with a private party to design, build, operate and finance a facility for a defined period (after which the facility reverts to the public sector). The facility is owned by the private sector for the contract period and the key drivers are the use of private finance and the transfer of design, construction and operating risk. Again, this is suited to a project that involves a significant operating element and is particularly suited to transport projects such as roads, car parks, etc. Concession: similar to DBFO except the private sector recovers costs from user charges (or parking charges). Again, private finance is used whilst design, construction and operating risks are transferred. This model is suited to projects where user charging is a key feature, such as a public car park. In addition to the above, alternative delivery models include service contracts where the asset remains in public ownership and the contract is typically short term (around 1 to 3 years in duration). The capital investment comes from the public sector and the contract covers a service fee paid by the public sector to the private sector for specific services, such as the operation of a car park. Operating and maintenance responsibilities are shared by the public and private sectors whilst commercial risk remains with the public sector. Management contracts can typically last for 3 to 8 years and refer to models where the private sector manages the operation of a public service and received fees paid directly by the public sector. In this model, operating and maintenance are the responsibilities of the private sector. Another model is that of a lease contract (lasting between 5 and 10 years) whereby the private sector manages, operates, repairs and/or maintains a public service to specified standards. Fees are charges to users and the service provider pays the public sector authority rent for use of the facility. Unlike the two other types of contract described above, this model features the transfer of commercial risk to the private sector. We can undertake modelling of demand within the context of competing providers or options to identify whether the parking is adequate for the peak days just before and immediately after Christmas and what the annual cost may be to provide this level of capacity across the whole year. It may be that an optimal and more cost-effective solution for the town relies not on providing more permanent capacity but using temporary solutions to expand peak period capacity when required. 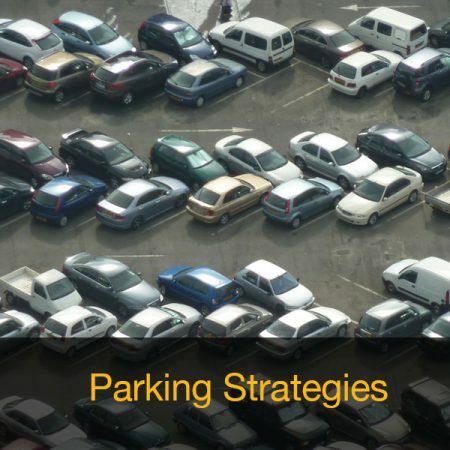 This type of strategy is highly suitable for seaside destinations that may incorporate use of temporary overspill parking sites during summer months, but also applicable for many situations where there are intermittent peak demands. We have used a number of tools to identify the potential cost of providing for the peak and helped our clients and stakeholders re-scope these peak demand problems in a more cost-effective way.